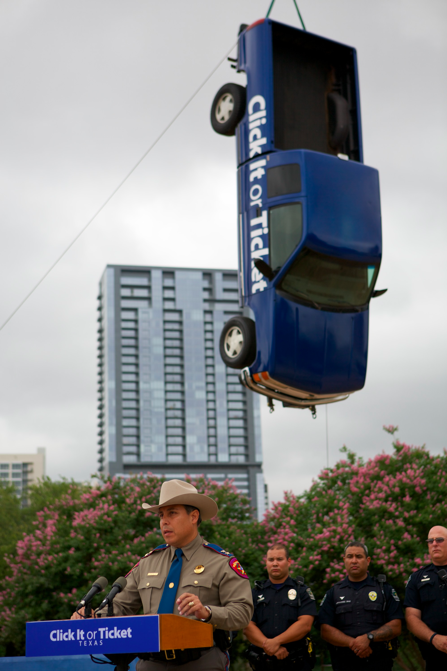 TxDOT launched its 11th annual Click It or Ticket safety campaign with a Click it or Ticket-themed pickup suspended in air with seat belt material. It’s part of the agency’s efforts to call attention to the life-saving properties of seat belts and alert motorists of the annual crackdown on those who don’t buckle up. Texas currently ranks seventh in the nation for overall seat belt use, and 93.7 percent of Texas motorists use their seat belts according to the Texas Transportation Institute. While Texas drivers and passengers are now buckling up in record numbers, seat belt use among pickup truck drivers and passengers continues to lag behind. That’s why safety officials especially are hoping to convince more pickup drivers and passengers to buckle up. See the full “Click It or Ticket” news release here.